With a 10-hour car trip to North Carolina this past week, I had plenty of time to catch up on my reading. One of the books I took with me to read was Vicki Watson’s Rosie and Scamper. This is the first book in the four book Sonrise Stable series. 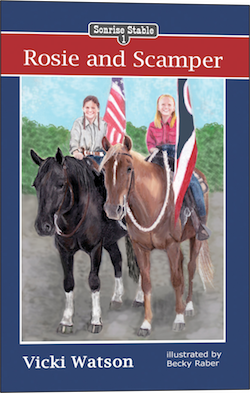 It is a wonderful chapter book for intermediate readers who love horses or would simply like to know more about them. Vicki does an amazing job of telling this story through the eyes of an eight-year-old girl, Rosie. She faces struggles and triumphs in the course of this book and her wise grandmother is able to tie in biblical analogies and lessons for the various situations. The read is learning right along with Rosie and her friend, Carrie, without feeling overwhelmed. Rosie and Scamper is a great story with loveable characters. I know that my older children would love to read this book. With the compelling story and beautiful pictures, my younger children would even enjoy having this book read to them. I recommend that you start the young readers in your life down the path to Sonrise Stable with Rosie and Scamper. Be sure to visit the website for more information, http://www.sonrisestable.com. Disclosure: I received a free copy of this book/Ebook/Product to review. I was not required to write a positive review nor was I compensated in any other way. The opinions I have expressed are my own. I am disclosing this in accordance with the FTC Regulations. I am a part of the CWA Review Crew.